Highly wear-resistant skirtboard liners guide material and absorb impact and abrasion. Canoe liners from Corrosion Engineering are engineered skirt liners that provide optimal wear protection and material containment for conveyor skirt applications. Conveyors often require heavy maintenance and repair when not properly contained and protected, resulting in increased costs and decreased production. Corrosion Engineering custom designs and manufactures economical skirtboard lining systems that protect your conveyor skirt, provide efficient material containment, improve conveyor safety, and reduce damage to conveyor belts and components. Corrosion Engineering skirtboard liners are manufactured with proprietary application-specific rubber compounds and advanced technical ceramics in extreme applications to provide significant wear resistance for conveyor components. These liners are custom-designed to suit the various needs of the application and goals of the customer. Our skirtboard liners are shaped to the exact fitting of the existing application and are engineered with thick rubber with a beveled edge to minimize spillage and prevent fugitive material from escaping. 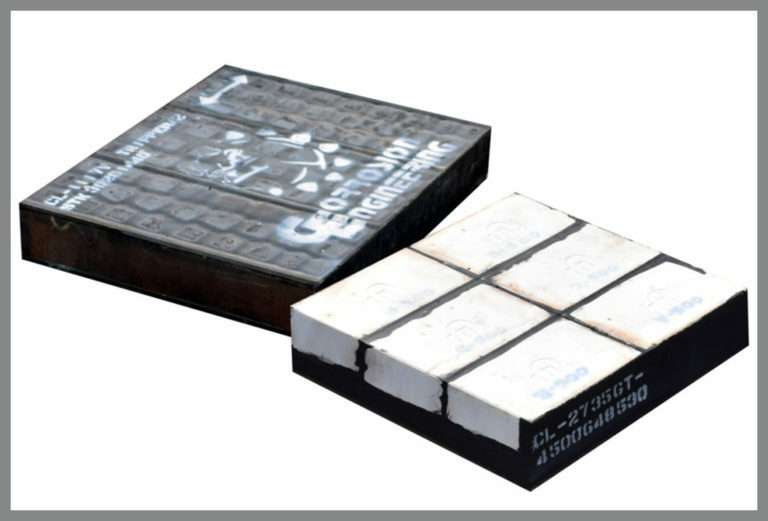 Advanced CorroCeramic elements can be incorporated intelligently for maximized performance in severely abrasive applications. Our adjustable skirtboard liners are easily and quickly installed. Corrosion rubber conveyor canoe skirtboard canoe liners are lighter weight, preventing injury during installation. The steel edges are not exposed, which minimizes chances of finger and hand injuries. Noise levels are dramatically reduced to greatly improve the safety of working environments. Corrosion Engineering’s skirtboard liners significantly outperform conventional steel and urethane wear liners with superior impact and abrasion resistance. The life of our durable rubber skirtboard liners is generally more than 10 times that of identical steel liners in the same applications. SURESEAL conveyor dust seals are extremely effective in containing dust and fine materials from escaping the belt area, helping reduce cleanup costs and improve working environments.